Is there a value to women-only space? Should a person who identifies as a feminist support women-only communities or endeavors? Who are our primary allies – women alone, or people of all genders who support fairness and equality? I don’t know if I can provide definitive answers to any of those questions, but I’ll try to open them up in the following blog post. 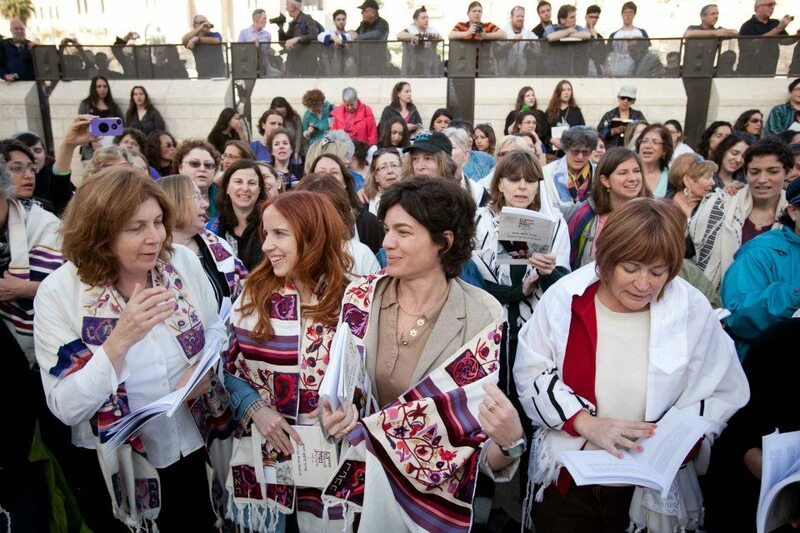 When I was living in Jerusalem last year, I had the opportunity to lead prayer services with Women of the Wall on that morning in March (Rosh Chodesh Nisan) when three female members of the Knesset showed up and prayed with us (check out the video here). After many months of arrests and detainments of women wearing prayer shawls, we were excited to see that this morning seemed to represent a turning point – not one woman was arrested that day. (I’m on the right, just above the woman on the right side in the front row with the short hair). I showed up that morning with a considerable amount of nervous energy – with WOW, there’s always the concern that you’ll get harassed by the ultra-Orthodox ladies in the ezrat nashim (women’s section) or that you’ll have chairs or eggs thrown at you. But once we got started, I found that being at the center of a group of powerful, determined women singing at the top of our lungs made me feel safer. The women on the outside formed a barricade with their bodies to protect the women in the center who were leading, and the members of the Knesset stood right in front (as you can see in the picture). As I began to recite each prayer and sing the familiar melodies as loud as I possibly could, I realized that I didn’t actually recognize the sound of my own voice. It was as if another voice from outside of me, strident and unfamiliar, had taken the place of my own, and I was just the vessel. I felt a real discomfort in relation to that scratchy, intense female voice. On one hand, it was empowering, but it also didn’t feel like me. My new voice became bound up with the voices of hundreds of other women, achieving an energy that was both thrilling and slightly terrifying. But there was another tension taking place that morning as well – the tension between women-only prayer in the women’s section, and our male supporters and allies who were restricted to the men’s section and the plaza area. My friends Naama and Amichai pushed back against this dynamic. Are we really pushing forward single-gender prayer spaces as the ideal?, they said. Isn’t egalitarianism the ultimate goal for true tolerance, and not segregation? 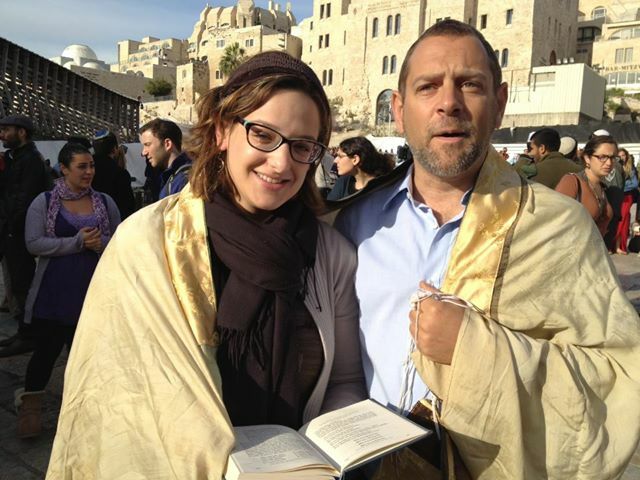 They chose to stand on the plaza, draped under a single prayer shawl, and neither was arrested. And isn’t that the society that I truly want too – a society where men and women are equals and can pray together with one voice? Why did I choose to associate myself with a women’s group where men couldn’t fully join us? I hear that tension too. It exists within me as I think about how to create change in my communities. And yet… I’ve experienced a sense of safety and comfort in women-only space that would be difficult to replicate in mixed gender space. Just like that circle of protection that the women created at the Kotel, we’ve created a safety net in our shared home. We let each other know if we’re going to go out for a run after dark. We notice when each other isn’t back for a while, and call to check in. We remember when a member of our group has something stressful or challenging going on in her life, and make a point to supply chocolate, hugs, tea, and back massages. We recognize from our shared experienced as women that the world isn’t always as safe and accommodating as we’d like for it to be. As a women’s intentional community, we’re also working to help each other cultivate our own voices. We’re committed to active listening and holding space for each other to grow, to try on new opinions and lenses, and to push the boundaries of our own comfort zones. I know that for myself, I’m working on developing the prophetic side of my own voice. What does it look like for me to speak out against the injustice that I see in the world? How do I do that in a way that can build consensus? Am I prepared to deal with the consequences of alienating people or dividing communities – or will I decide that certain issues aren’t worth that risk? Just like that day at the Kotel when I took on an unfamiliar, intense tone to my voice, I’m practicing doing that in my interfaith women’s community as well. I believe that there will continue to be a need for women-only space, as a haven from the patriarchal nature of many of our institutions and as an incubator for new ideas. And truth be told, I can’t see myself ever living permanently in either world. I’m someone who’s constantly crossing boundaries, back and forth between worlds, bringing ideas from one space into the next. I’d love to hear your thoughts on the need for egalitarian space vs. more limited space, and how different spaces can change the nature of our conversations and ourselves. Lauren Henderson Lauren Henderson is a fourth year rabbinical student at the Jewish Theological Seminary. She completed her BA in Religious Studies and History at Rice University in 2009, and spent a year learning at the Pardes Institute in Jerusalem and two years at the Ziegler School of Rabbinic Studies in Los Angeles. Lauren has had the opportunity to learn and work at IKAR, Cornell Hillel, Adamah Adventures, and with Encounter. She is originally from Spartanburg, South Carolina and currently lives in New York City. Lauren currently serves as the Rabbinic Intern of the Pelham Jewish Center in Pelham Manor, New York. I can speak only about the WOW women’s only prayer group. What’s the advantage? It makes being pluralistic much easier. Or even possible. Our group manages to incorporate Orthodox, Conservative and Ashkenazi and Sefardi prayer tradition. To be fair, this arrangement works not only because of the female composition of the group, but also because the group meets only once a month. This is a characteristic of women’s only space – the segregation is limited in time. Why does it have to be ‘vs’? Why can’t we do both? I am part of a Reform congregation because it answered my family requirement for (among other things) an egalitarian prayer environment. But my belief in the rights of women to make aliyah to the Torah, to pray in a tallit and to lead services isn’t restricted to the women of the Reform Movement or those in an egalitarian congregation. And if I want to be truly pluralistic I must include those women who do not want to pray alongside men. The WOW are not about who we are praying with but how. The orthodox males at the Wall have decided that women should only pray in a certain fashion and WOW are protesting this for all Jewish women. This can be witnessed by the range of affiliations of the women participating in WOW.